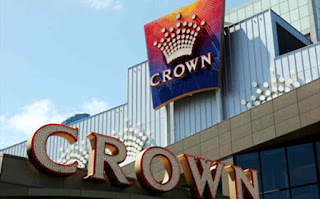 Is Austalia's Giant Crown Casino Cheating to get back at the Cheats? Is the Crown cheatng its players? A few years back, the Crown Casino in Melbourne was the victim of a giant insider-casino-scam to the tune of some $40 million. Several employees including surveillance inspectors rigged camera locations to film playing cards to be used at baccarat tables. The scam hurt the Crown and was also a huge embarrassment. Well, now the Crown casino itself has been accused of turning the tables on the cheats, that is the poker-machine tables. Whistleblowers in the country's federal parliament claim that Crown executives ordered the tampering of poker machines to increase the amount of money the players lot. Of course casino authorities deny these very serious allegations, but if they are proven to be true, he harm to the Crown casino Melbourne and all its other worldwide casino properties could be devastating. Can he stop the high-tech casino cheats? Remember the mysterious Russian math whiz and cyber-gang casino-cheat leader known as Alex who figured out how slot machines manufactured by Australian gaming company Aristocrat Leisure generate the pseudo-random numbers that determine when the machines odds shift in favor of the player? Well, if you don't, Alex sent an army of cyber casino-cheats to invade casino slot machines worldwide armed with this knowledge--and they won/cheated tens of millions from major casinos on several continents. Well, now Blaine Graboyes, a gambling-machine guru and current CEO GameCo, Inc., a manufacturer of video-game gambling machines, says he has the answer to combat this type of cyber casino-thievery. Read all about it in this very interesting article. Could the recent Las Vegas Massacre have had anything to do with Casino Gambling or Cheating? Normally I do not stray off course when writing articles for this blog, mainly sticking to topics that are directly related to casino cheating or casino advantage play. But sometimes I do, and this will be one of those times. We are all interested in what could have propelled Stephen Paddock to commit such a horrific crime and take the lives of so many people and injure hundreds more. We have not heard of any connections to white supremacist groups or international terrorist organizations, or anything else that could have driven him to take revenge against someone or something. However, we have heard that some big-time gambling and big-time gambling losses have played a significant part in Paddock's confusing past. In fact, it has been reported in the media that Paddock has claimed that he'd lost in excess of a million dollars gambling in casinos in a single year. It has also been established that Paddock unsuccessfully sued the Cosmopolitan casino for $100,000 in damages after he fell and injured himself in a casino. The casino was able to prove that scores of other people did not fall where Paddock had. Perhaps Paddock hatched this scheme to get back some of the money he lost gambling? So could any of this have played a part in his motive? Well, I have heard about gamblers losing lots of money, in some cases everything: meaning their homes, savings and family. Some of these people do flip out and do crazy things. Some of them blame the casinos, falsely accusing them of luring them to gamble away their life savings at their tables--as if they had a gun to his head. And perhaps Paddock had another gripe to pick with casinos for not being found legally responsible for his fall. I sure hope this has nothing to do with Paddock's motive; I'm sure the Las Vegas casinos hope so as well, as this type of revelation would be severely damaging to their public relations. And even though I doubt at the end that this is somehow behind Paddock's motive, unfortunately it is entirely possible--given the fact that no clear motive has been established or released by any investigative authority.